When Johnny's, a family-operated pizzeria since 1968, found out that Papa John's was moving in right next door, its fans quickly swung into action collecting 2,000 signitures to try to pursuade Papa John's to find another location. But Papa John's refuses to budge and it looks as though a showdown is looming. 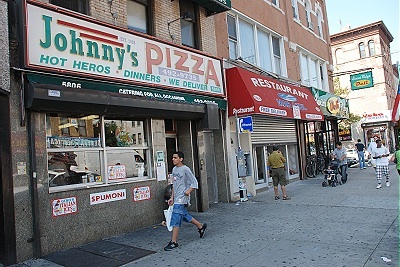 Johnny's was founded by John Miniaci, who emigrated to this country with his wife Lilia, on 58th Street in Sunset Park, Brooklyn where it still stands today. When he died a short time ago, the business was left to his son, John Miniaci Jr. and his son-in-law Rocco Coluccio. Both have a strong sense of pride in the restaurant and the community it serves and are hoping to keep the legacy of Johnny's alive. They're also asking for the help of their elected leaders, including Senator Hillary Clinton, fearing that competition from a major chain like Papa John's could destroy their business. We'll keep you posted on how it all plays out. Copyright © 2017. All Rights Reserved Johnny's Pizzeria-Brooklyn, NY.